The Columbia Restaurant was open in downtown Put-in-Bay in June of 1873. Here, guests chose from a selection of beer, wine and food. Most notably, was ice cream and cottage cheese. In this time, these choices were sought after. Additionally, in this era, there wasn’t electricity in the building. So, in the Winter blocks of ice came from the lake. Then, the ice house at the present day Put-in-Bay Winery held the ice. Prominent banners stretched across the street advertising ice cream treats. Then, in 1888 the first mention of the Roundhouse name surfaced in a newspaper article. Also, the article listed George F. Schmidt as one the early owners. Then, in 1944, the Greunke family bought the Roundhouse for $11,000. This family had the circular bar built by the Cincinnati Brewing Company. Additionally, Mrs. Greunke was a pianist and would entertain patrons “in the round.” However, this required her to play with her back to the crowd. So, the stage was moved to its current location. Lastly, this family constructed the canopy inside the cupola. This aids in the acoustics of the building. Now, the McCann family owns the Roundhouse. They purchased the bar in the early 1950’s. Most notably, they painted the exterior red. Most of the building is original, with the exception of the floor and front porch. However, the plaster walls have remained. Today, murals by a local artist Canoe Bob grace the walls. The entertainment at the Roundhouse is always top notch. Additionally, there is a large schedule of acts performing every day of the week in peak season. One of the most prolific and recognized entertainers is Mike “Mad Dog” Adams. His energetic comedy and music routine is a must see. Come and buy a famous bucket of beer and pull up a seat for “Perch Church.” Mad Dog has been playing the Roundhouse stage for over 35 years. He can be found most weekends at 2 PM. This a great thing to do on Put-in-Bay. 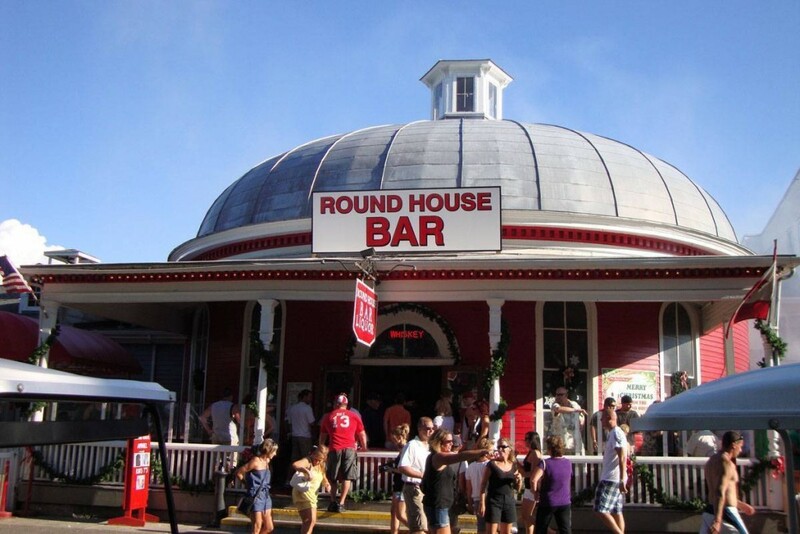 For great drinks and exceptional entertainment, stop by the Roundhouse Bar. The history and tradition is permeating from the walls. Come and see for yourself. You’ll be glad you did!